With additional support from theChina Academy of Art’s Intermedia Department. Participating artists include: Bignia Wehrli, Liao Wenfeng, David Siepert and Stefan Baltensperger. The project lasts for one month. The present projects have grown out of friendship——that which has developed between the participating artists. Everything began one evening in the February of 2013——during the Swiss winter——when by the hearth of their quarters the artists prepared a Chinese-style hotpot to mark the beginning of the New Year’s Day. There, the nourishing aromas and rolling boil of the pot itself, the undulating, oral exchanges that took place, along with the unforeseen headaches brought on by the concurrent carbon-monoxide fumes—— the sparkling stars, the night sky, fireworks and the rejuvenating effects of a welcome gust of fresh air… It seems all these things somehow capitulated to create circumstance of sorts——A relational platform at once both specific, apparently transient but at the same time also enduring in its influences. Inside this HOTPOT —— the broth itself—— between the ingredients a sort of perpetual harmonising occurs —— of flavours, quality —— All these things (even the carbon-monoxide! )—— all offer up their nutriment, working to modulate each diner’s state. Note: HOTPOT here functions as both metaphor and medium. 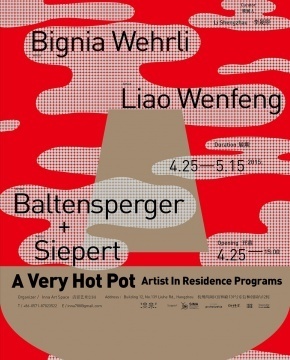 We hope that during the one-month period of the Hangzhou SUPER-HOTPOT residency, the participating artists might find other media——Media analogous to afore-described Swiss HOTPOT circumstance —— Something which might permit that they begin to take more active roles in their attendant circumstances —— in the China of today —— That they might become embroiled in and intermingle with its occurrence, its modulations and cycling ——But at the same time, we hope also that they might face up to all those as-of-yet still unknown phenomena —— all that might still come to pass. The circumstance we imagine for the forthcoming exhibition itself might be thought of as constituting a sort of perpetual occurrence —— A happening in itself —— Something like the rolling boil of the HOTPOT. In the present projects’ one month duration, participants will hopefully utilise their own means to bring the traces of any and all associated happenings —— occurrences—— to realisation. Following this, the exhibition space itself ought to be approached as a sort of perceptual catacomb or reliquary —— a narrative entity born of conversion and translation that is itself a happening, another occurrence constituted by the cycling of whatever occurs——or has occurred—— during the interim. Here, all these things commingle to institute a site. This is our reference —— the means by which we gauge the nature of those things still yet to come.